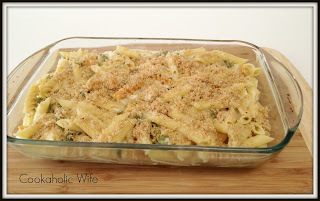 I am very sad to tell you that it was quite some time ago that I made this recipe, but I am only getting around to sharing it with you now. This is really something you should have the pleasure of introducing your taste buds to. I’m sure they will thank you immensely. If you look closely at the picture, you’ll see that there are two different types of pasta in this dish. The traditional penne that it calls for, but also some tri-color rotini. Why? Because apparently I can’t manage to keep 8 oz. of any one type of pasta in the house. So we had about 3 oz. of penne and about 5 of the rotini. I think the orange rotini noodles match nicely with it, no? I somehow managed to skip right over the cilantro and the lime juice/zest while writing the ingredients I’d need for this recipe, so I just omitted them. 2. Slice the poblanos in half length-wise and remove the seeds and membrane. Place skin side up on a foil-lined baking sheet. 3. Broil for 5-6 minutes or until blackened. Transfer peppers to a paper bag, fold closed and let sit for 5 minutes. Once cool enough to handle, peel off skins and chop pepper into bite-sized pieces. 4. Meanwhile, bring a large pot of lightly salted water to a boil. Add the pasta and cook according to package directions. Drain and set aside. 5. In a small bowl, combine the Panko, oil and red pepper flakes. Set aside. 6. In a medium saucepan over medium heat, combine 3/4 cup milk, stock, flour and garlic. Whisk together and bring to a boil. Cook for 3 minutes or until the mixture thickens. 7. Remove from the heat and stir in the chiles, remaining milk, cheese and sour cream until combined. Pour over the pasta and stir until combined. 8. Spray a baking dish with non-stick spray. Pour pasta mixture into the dish. Sprinkle with Panko mixture and broil for 1-2 minutes or until browned. Absolutely delicious. I rarely go back for seconds of any meal, but I couldn’t pass it up with this one. 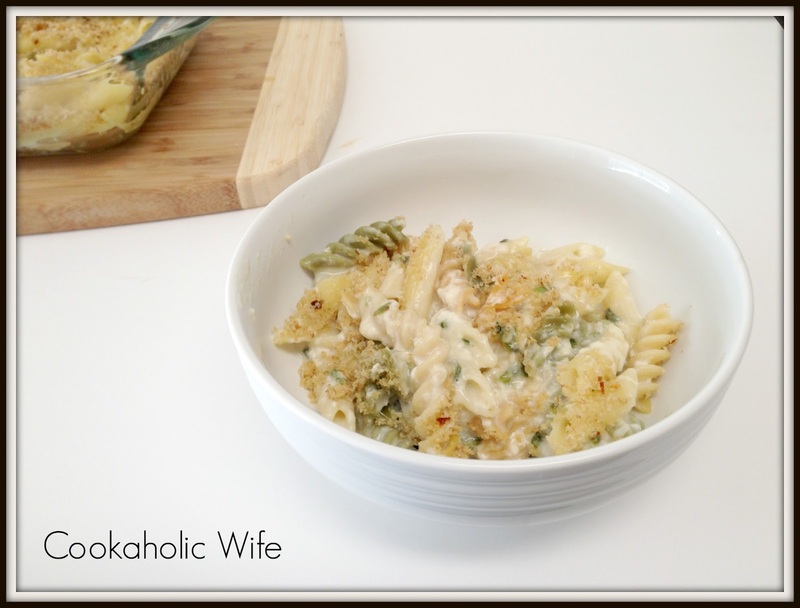 Cheesy pasta poblano love. I love poblanos, I bet that they are delicious in macaroni and cheese! Hmmm… poblano peppers is something I don't usually buy but I do like the flavor of them. 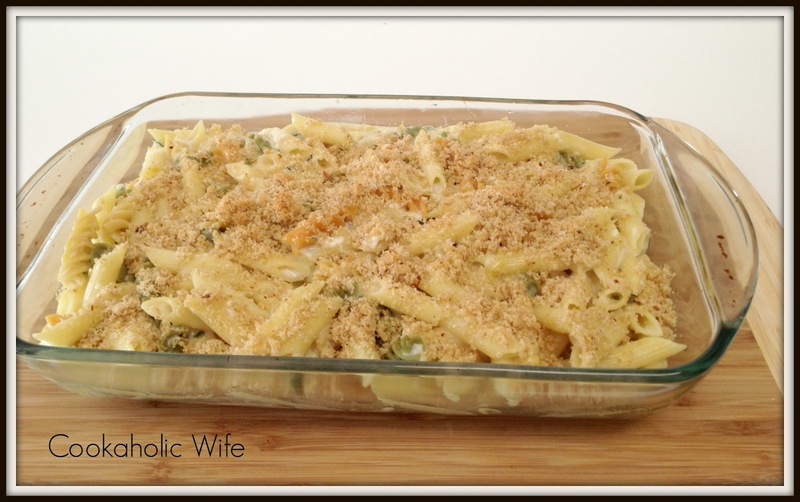 What a great way to incorporate them into mac & cheese!